Sony announced their fiscal year earnings and also their forecast for the new fiscal year today. Before I continue, let me warn you that I'm going to present you with an analysis that no one else is presenting. That means I'm either ahead of the curve or blind as a bat, and I will freely admit that it may well be the latter. I'm seeing some things between the lines, though, that I think are interesting. 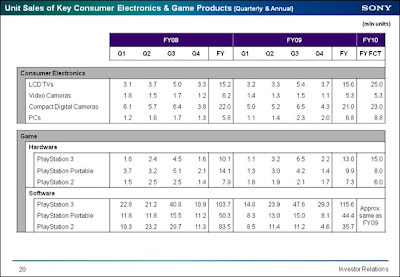 So software units are projected to stay flat, but in hardware, only the PS3 is projected to grow, and only by 15%. In other words, no PS3 price cut this year. Forget it. We're going to hit the four-year anniversary of the PS3 launch this fall, and the system will still be priced at the launch price of the PS2. Sony also appears to be engaged in magical thinking. Let me get this straight: PS2 software sales declined by 57% last year, but this year they're going to suddenly stabilize? Really? 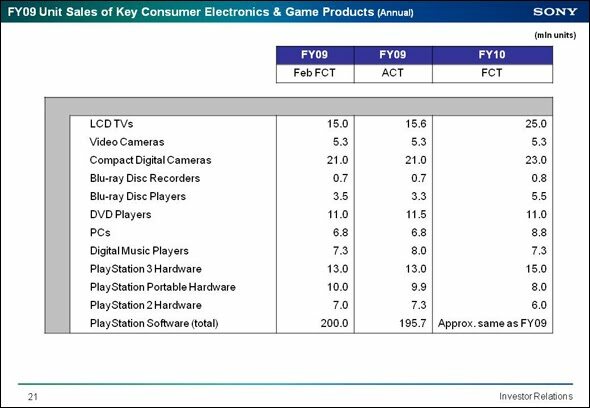 One of Sony's problems, and it's been on the horizon for years, is that PS2 software sales have declined much more quickly than PS3 sales have increased. Combined software sales dropped from 187 million to 151 million units, and with PS3 software sales projected to be flat, that's not going to improve. Clearly, the gaming division is not in a profitable environment right now. It's difficult to get exact numbers, because Sony has lumped gaming in with PC's and digital music players, but the umbrella unit--Networked Products & Services--lost 83.1 billion yen in the last quarter. So Sony's game business is struggling. Big deal--we all knew that already. Far more interesting, though, are some hints that Sony sprinkled into their forecast for the new fiscal year. Sony just laid out their entire FY10 strategy for us. That couldn't be more obvious: Sony doesn't give two shits about anything but LCD TVs this year. That is a gargantuan projected increase. Well, and PCs, to a much lesser degree--they're projected to increase almost 30%. But that's only half the projected percentage increase for LCD television sales. Note: yes, I see the projected increase for Blu-ray players, but that's off a miniscule base. We're talking about almost ten million additional televisions being sold in this fiscal year. Sony isn't abandoning the PS3, but they're not pushing it either, projecting only 15% hardware growth and flat software sales. Gaming used to print money for Sony, but there hasn't been a profitable quarter for what--four years now? Sony used to shout that the PS3 was the future of the company, but those days are long gone--Sony couldn't afford that future. What they're pushing, instead, are LCD televisions, and with that kind of forecasted increase in sales, get readly to be deluged with advertising for Sony televisions. That's where the lion's share of the advertising and promotions are going to go this year.